File photo of action at the Timonium sales grounds. Photo by The Racing Biz. Consignors — and the sales company itself — are entering the Fasig-Tipton Midlantic Fall Yearling Sale in high spirits. 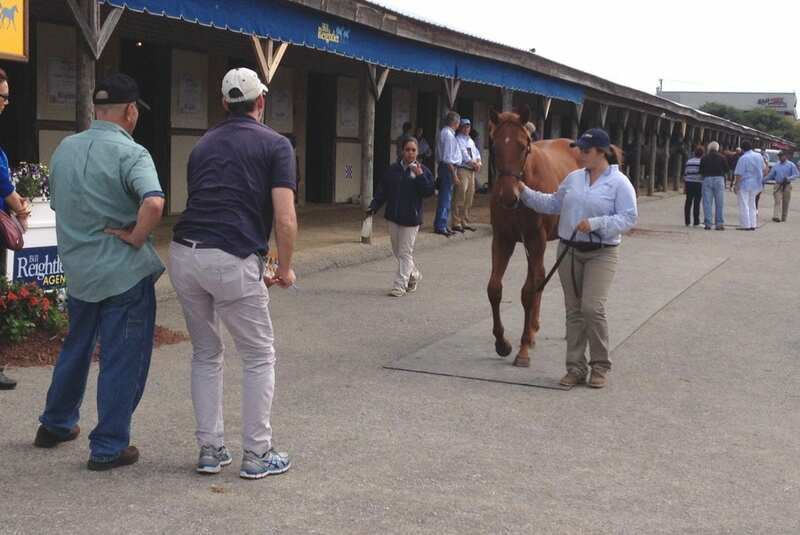 The sale, with 500 numbered hips prior to outs, begins at 4:00 p.m. Monday at the Timonium sales pavillion for Hips 1-150 and continues Tuesday, starting at 10:00 a.m., for the remainder. That optimism is built on a couple of factors. For one thing, there are the positive results from the company’s two major prior yearling sales, the July Sale in Lexington, KY, and the Saratoga Sale, as well as Keeneland’s September sale, where gross receipts rose 22 percent versus 2017. “The markets in Kentucky seemed to be strong,” consignor Bill Reightler said. Reightler has a 43-horse contingent that is one of this sale’s largest. “Honestly, expectations are pretty high, given the results I saw in Lexington,” agreed industry veteran Mike Palmer, general manager at CandyLand Farm. CandyLand has a 22-horse consignment that is likely to include some of the sale’s pricier horses. For another, there is the sense that the high prices at the recent sales may have driven some of the yearlings past the price points of a lot of pinhookers, who now will be looking to fill their orders in Maryland. “They missed out on some horses,” Palmer said. There is also the strength of the region’s state-bred programs, with the new Virginia-certified designation giving regional horsemen a new tool that adds to state-bred programs like those in Pennsylvania and Maryland. “A lot of people are actually asking for Maryland-breds,” Moore agreed. What buyers will find when they arrive is a mix of horses sired by high end, nationally prominent stallions, yearlings by hard-hitting regional studs like Great Notion, and newcomers. Perhaps that’s fitting for a sale with a catalog cover featuring four recent graded stakes winners, including Grade 1 winner Long On Value, a son of Value Plus who sold here for just $3,000 in 2012. Palmer’s consignment, for example, features yearlings by Into Mischief, who stands for $100,000, and Malibu Moon, who stands for $75,000 and who got his start in Maryland. Reightler offers, among others, Hip 398, a Creative Cause filly with plenty of black-type behind her. Yet all of the consignors also expect that the chasm between the horses that “check all the boxes” — those around whom the pinhookers will flock — and other horses will continue or perhaps, given the expected increase in pinhookers at the sale, even grow. “When you get up to the big horses, if you’ve got the goods, they’ll pay what they need to,” Palmer predicted. That requires, consignors said, that those selling horses with less commercially fashionable pedigrees or other constraints need to be tempered in their approach and expectations. Louis Merryman, selling as Anchor and Hope Farm, has a five-horse consignment that includes homebred yearlings by stallions he also stands, including two by Imagining and one by Bourbon Courage. Both well regarded, neither has any runners to date. The right hands are likely to be those of end users in the region who, Merryman hopes, can develop them into successful racehorses. In fact, he’s not alone in that desire. Maryland, in particular, has seen an influx of new sires in recent years, including several that, like Merryman’s duo, don’t yet have runners on the ground, or, such as Freedom Child, have only a handful of two-year-olds to have raced. Still, as Sunday went on, the mood was upbeat. “Good horses come out of this sale, and runners come out of this sale,” Fasig-Tipton’s Bennett said.